when i hear many illegal immigrants and their supporters say the illegal people want to live in the united states, why is it that there are always so many foreign flags? 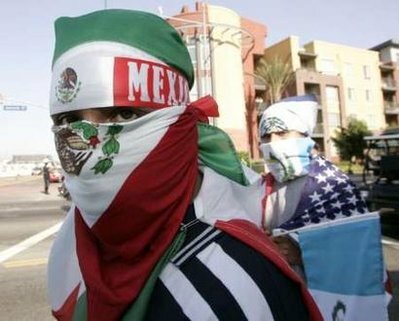 when i see them protest i see many mexican flags and foreign flags yet so few united states flags. Anti-immigrant websites like to edit out photos of Latinos carrying American flags, choosing to crop photos to show the everpresent Hispanic nation flags. The rallies and marches are actually very diverse with many different types of people with different types of feelings. You see some Mexican and other flags, but what do you see more of? Anti-immigrant websites like to edit out photos of Latinos carrying American flags, choosing to crop photos to show the everpresent Hispanic nation flags. The rallies and marches are actually very diverse with many different types of people with different types of feelings.You see some Mexican and other flags, but what do you see more of? 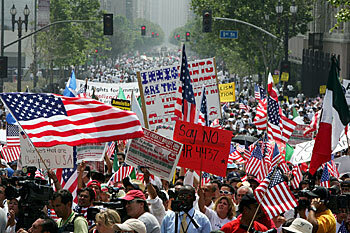 i dont think its anti-immigrant to be opposed to those who want legal status for illegal immigrants. wouldn't that be anti-illegal immigrant? Well, that's their story, and they're sticking to it. Legal immigrants; brown Mexican or otherwise, are welcome here in the USA. Illegal aliens are criminals and need to be deported along with having their assets seized as well. Check original post for topic of thread. when i read or see people protesting against amnesty or illegal immigration i dont see people hating legal immigrants but illegal immigrants. is there supposed to be a distinction between the two? The photos you have shared represent the strategy illegal alien advocacy groups have employed to counter the notoriously stupid display of arrogance we witnessed during their massive marches in 2006. It was precisely the brazen prevalence of foreign (predominately Mexican) flags that opened the eyes of many citizens. After the widespread backlash, La Raza, et al. instructed their “immigrant” marchers to display U.S. flags. They are not waving U.S. flags because they yearn to become citizens of this country. They are not waving U.S. flags because they appreciate the opportunities this country has afforded them, notwithstanding their illegal status. They are not waving U.S. flags because they “feel” American. They are only waving U.S. flags to further their agenda. Their “true” feelings were blatantly exhibited during their initial marches, and the damage has been done. We are not fooled. And the truly sad part of those insolent losers' behavior is they are endangering those innocent people (of any actual race/ethnicity) who look stereotypically Mestizo.